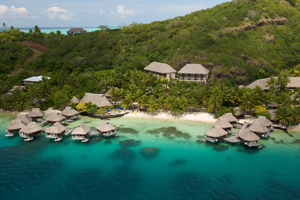 Just an hour's flight away from the islands of Tahiti and Moorea lies the enchanting and romantic island of Bora Bora. You will be seduced by the sparkling, translucent waters of the lagoon, the rugged mountains, the dense tropical vegetation, the many excursions and the warm welcome by the inhabitants of the island, which attracts celebrities, artists, newlyweds, and lovers in search of an authentic paradise. Two volcanic peaks dominate the heart of the island of Bora Bora, creating an impressive backdrop in contrast to the lagoon waters that change constantly from emerald green to the deepest blue. A 32km long road runs the length of the coast, making it possible for you to go completely around the island and almost never rise above sea level. By bicycle the road may seem a bit difficult, but by scooter or car, you can enjoy the landscape without getting tired. Bora Bora, the Pearl of the Pacific, is truly a dream destination. Take a moment to visit our photo gallery to catch a glimpse of the magnificence of this island. 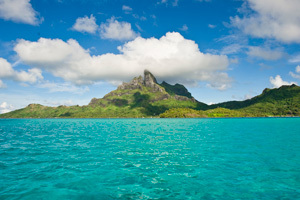 Historians believe that Bora Bora was uninhabited up until the ninth century, until the arrival of Polynesian voyagers who first crossed the Teavanui pass, the only point of passage in the immense barrier reef that surrounds the island. They called the island Vavau, which means "first born." It is likely that these early explorers were from Tonga, but there is no physical evidence of this. The name Vavau has evolved over the years to become Pora Pora, and finally Bora Bora, probably in 1769 when Captain Cook discovered the Leeward Islands. Two European explorers claimed possession of the island a year apart from each other in the 18th century, the English navigator Samuel Wallis on behalf of Great Britain, followed by the French navigator Louis Antoine de Bougainville. Protected by its island warriors, Bora Bora resisted European colonisation until it was conquered by France in 1888. In 1946, Polynesia, including the islands of the Society archipelago, became an overseas territory of France. In 1958 it became officially French Polynesia. The United States discovered Bora Bora during World War II, when the U.S. military used the island as a supply base in response to the attack on Pearl Harbor in December 1941. The 5,000 soldiers installed defenses along the coast to protect the island against a possible surprise attack by Japan. They also built the coastal road and the first airport on Motu Mute. The international reputation of Bora Bora developed over the years thanks to artists, writers and navigators who visited the island. The American writer Herman Melville wrote several stories about Polynesian life in 1846 and 1847. In the 1890s, the French artist Paul Gauguin published an illustrated book called Noa Noa, telling the story of Areori who lived on Bora Bora, and the creation of Noa (fragrance), as the first miracle of the gods.